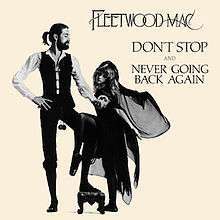 "Don't Stop" is a song by the British-American rock band Fleetwood Mac, written by vocalist and keyboard player Christine McVie. Sung by Christine McVie and guitarist Lindsey Buckingham, it was a single taken from the band's 1977 hit album, Rumours. It is one of the band's most enduring hits, peaking at No. 3 on the Billboard singles chart. In the UK market, "Don't Stop" followed "Go Your Own Way" as the second single from Rumours and peaked at No. 32. In the U.S, it was the third single released, and peaked at No. 3 in October 1977. It was used by United States presidential candidate Bill Clinton as the theme for his first campaign, most notably at the 1992 Democratic National Convention. Upon winning the election, Clinton persuaded the then-disbanded group to reform to perform it for his inaugural ball in 1993. At the 2000 convention, he ended his speech by saying, "Keep putting people first. Keep building those bridges. And don't stop thinking about tomorrow!" Immediately after the final sentence, the song began playing over the loudspeakers. The song was also played for Clinton's appearances at the 2004, 2008 and 2012 conventions. A cover by Elton John was included on the 1998 compilation Legacy: A Tribute to Fleetwood Mac's Rumours. Status Quo covered the song in their 1996 covers album Don't Stop. Scottish singer-songwriter and guitarist Nina Nesbitt released a cover version of "Don't Stop" on August 23, 2013 in the United Kingdom. It is included as one of the many songs in "The Official BBC Children in Need Medley". It was also covered in 2010 by the cast of the TV show Glee in the episode titled "Rumours". ↑ Brunning, Bob .(2001). Rumours And Lies: The Fleetwood Mac Story. ISBN 978-1-84449-011-0. Retrieved January 2, 2007. ↑ "Ultratop.be – Fleetwood Mac – Don't Stop" (in French). Ultratop 50. ↑ "Offiziellecharts.de – Fleetwood Mac – Don't Stop". GfK Entertainment Charts. ↑ "Dutchcharts.nl – Fleetwood Mac – Don't Stop" (in Dutch). Single Top 100. ↑ "Fleetwood Mac: Artist Chart History" Official Charts Company. ↑ "Archived copy". Archived from the original on 2016-03-04. Retrieved 2016-07-26.